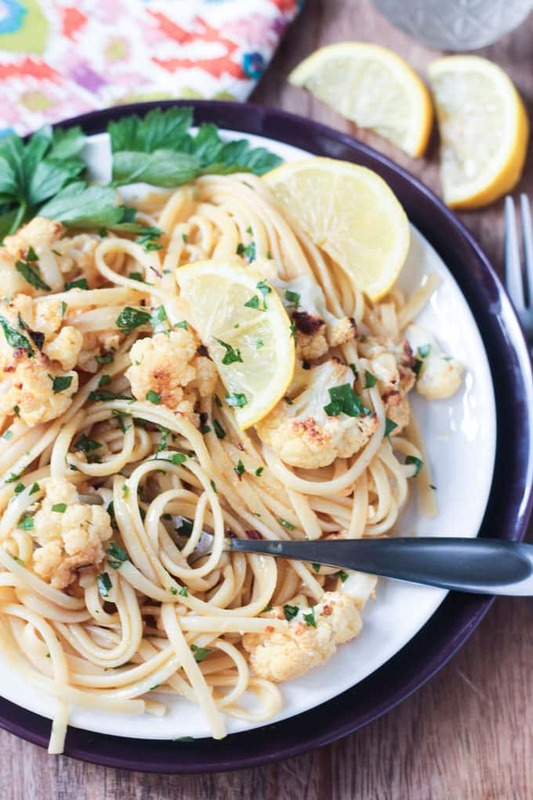 Cauliflower Scampi in Lemon Garlic White Wine Sauce – needs only a handful of ingredients and is ready in less than 30 minutes. Weeknight winner! My last cauliflower recipe – my Roasted Cauliflower Salad w/ Lentils & Grapes – was back in March, so you know I was due for another one. You guys continue to love on my Crispy Baked Cauliflower Tacos and my Buffalo Cauliflower Bites, so I can only assume you love this white veggie as much as I do. 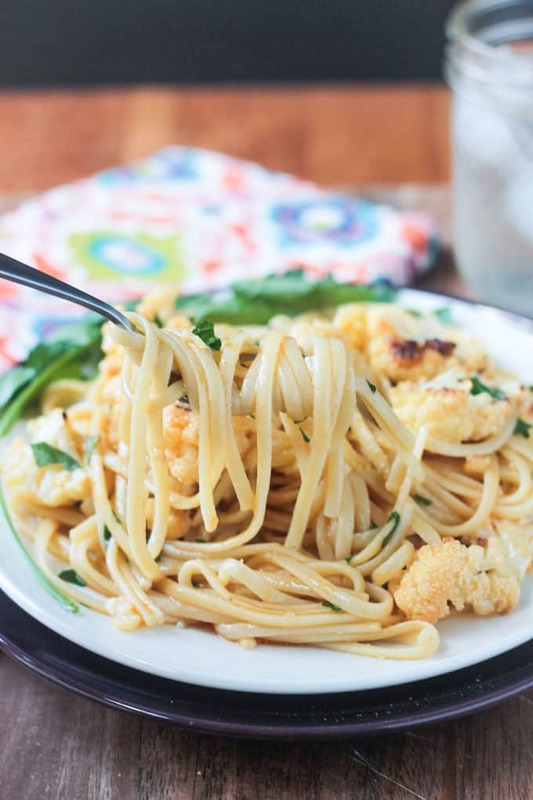 Today I’m bringing you this quick and easy pasta recipe with roasted cauliflower, lots of lemon, and a garlic white wine sauce. It comes together in less than 30 minutes, so it’s perfect for a weeknight. But it’s also classy enough for entertaining! Scampi is a type of lobster, or more accurately, the meaty tail of a certain type of lobster. Here in the U.S. though, it generally refers to a dish made with shrimp in a sauce consisting of garlic, butter, and wine. Sometimes, breadcrumbs or Parmesan cheese are added as well. You can’t really go wrong with lots of garlic, lemon and wine, right? 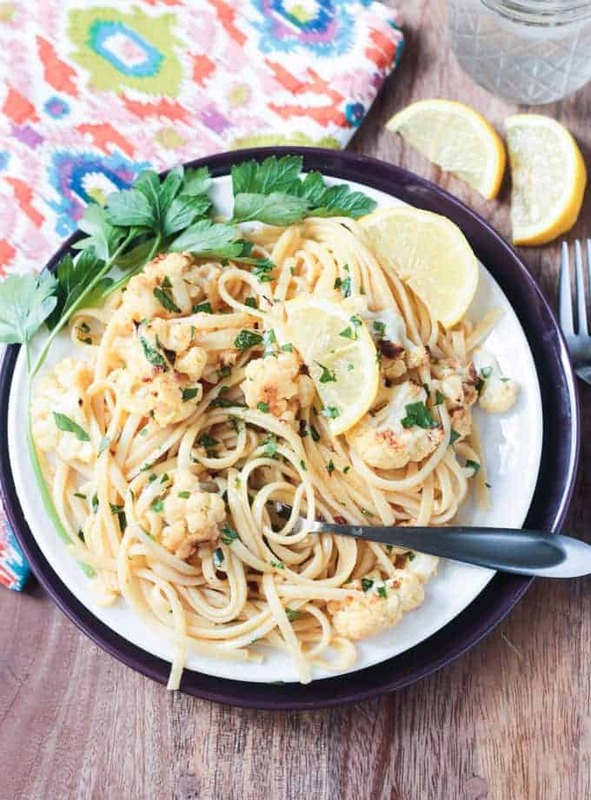 Of course, we’re making this scampi without shrimp or lobster. Instead, I roasted cauliflower with olive oil and lemon juice until tender. It’s SO GOOD that it almost didn’t make it to the pasta…I was eating it straight from the pan! So, take note, that this roasted cauliflower by itself would make a great side dish for any other meal you’re planning too. Cauliflower is a cruciferous vegetable and, although it is white in color, has many of the same health benefits that you find in the cruciferous green super food veggies like broccoli and kale. It contains many antioxidants, as well as being high in vitamins and minerals like vitamin C, K, B’s, folate, fiber, potassium, healthy omega-3 fats, and even protein. The sauce makes just enough so the noodles are coated, but not swimming in it. The perfect amount if you ask me. Light enough for a quick summer meal, but filling enough to be winter comfort food. Delicious all year round! 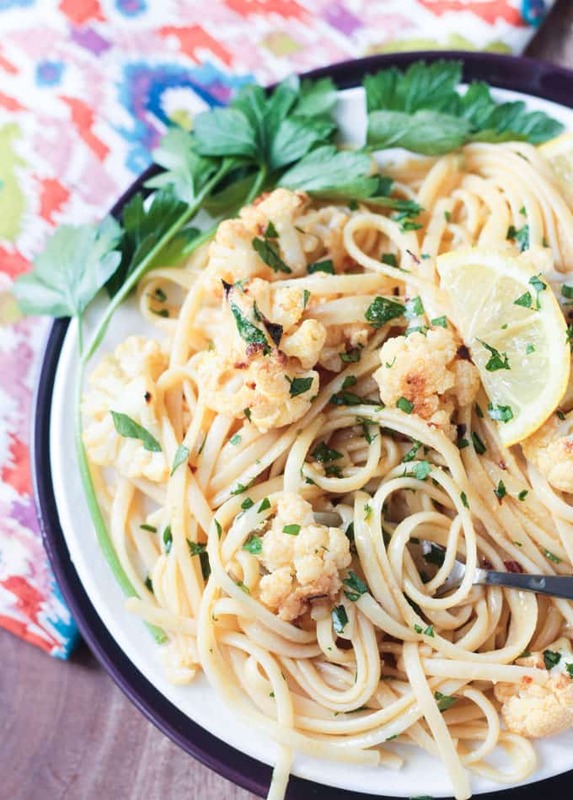 I hope you love this Cauliflower Scampi in Lemon Garlic White Wine Sauce as much as we do. If you make it, please come back and leave me a comment below with your feedback. You can also find me on social media. Be sure to tag @veggie_inspired and #veggieinspired so I’m sure to see it. Enjoy! Cauliflower Scampi in Lemon Garlic White Wine Sauce - needs only a handful of ingredients and is ready in less than 30 minutes. Weeknight winner! Toss the cauliflower florets in 1 tbsp olive oil, 1 tbsp lemon juice and 1/2 tsp salt. Spread onto the prepared baking sheet in one even layer and bake for 15 minutes. Shake the pan to toss the cauliflower around, let it settle back into an even layer, and bake another 10 minutes. Meanwhile, cook the linguine according to package directions. While the pasta and cauliflower are cooking, heat 1 tbsp olive oil over medium heat in a large pan on the stove. Add the garlic and sauté 1 minute. Add the white wine and simmer 3-4 minutes until the liquid reduces a bit. Add the lemon juice and broth and simmer 5 minutes. When the cauliflower is done, toss it into the white wine sauce. Add the cooked pasta and toss to combine. Add the fresh chopped parsley and red pepper flakes. Taste and adjust seasonings. Add a little more lemon juice or salt if needed. In a coffee grinder or small food processor, grind the pepitas with the nutritional yeast into a course powder. Sprinkle the pepita mixture, if using, over the cauliflower and linguine and serve immediately. *Use gluten free pasta if desired. This was wonderful. Normally I always need to tweak recipes but this one was great right off the bat. Thank you, Benjamin! So happy to hear that! I made this tonight and WOW! It was so delicious! My husband and I are happily stuffed 😊 Thank you for this delicious scampi! We didn’t miss the shrimp one bit and it completely satisfied our craving! Yum! So a few days later…but we finally had a chance to make this…oh my word! This is so good, it’s unbelievable! I can’t say enough about it. Thank you so much for posting this recipe! Yay!! Thank you, Diana! I’m so happy you loved it!! I see that people have tried this and I would like to, but it doesn’t give the “Garlic White Wine Sauce” I think the link is deactivated. I “searched” your website and it does come up that way either. Please help me out…this looks awesome and I can’t wait to try it. Hi, Diana. The ingredients and instructions for the sauce are all there. It’s not a separate recipe. Hope you enjoy it. oh boy…I sure missed that! Thanks for bringing to my attention…it’s on the menu for dinner tonight! The calcium count in the nutritional values seems wrong. Thanks for pointing that out, Dev. It was indeed wrong. I’ve updated the stats. Thank you so much, Andria! So happy you loved it!! Can’t go wrong with pasta and wine, right?! Thanks so much for stopping by and leaving your feedback! You know, I haven’t had a lot of luck getting cauliflower sauce to go over in our house. Rice, yes, sauce, not so much. But your use of olive oil and wine just might do the trick! Well, wine does make everything better. Baked tofu would also be yummy in this if you want to replace the cauliflower. This looks like my kinda meal! I want to drink that sauce with a straw! What a clever idea! I love this. We love cozy comforting pasta dishes! I love that this one is still light and flavorful! YUM! Yes, we do too. Everyone loves pasta! Thanks, Laura! I am so excited to try this recipe! Shrimp scampi has always been a favorite Italian dish of mine but a vegan version sounds even better. Bookmarked for next week! Yay! Thank you, Whitney! I hope you love it! I’m a little confused- in the blog post you said you roasted the cauliflower in lemon juice & olive oil. But in the directions you only roast in salt & pepper. Am I missing something? Oh my gosh – thank you for pointing that out! I forget to add the lemon juice to that part of the recipe. Thanks, Emily! It was a big hit with my hubby! Looks SO good! And love the cauliflower variation. Must try this very soon! Thank you, Christine! I hope you enjoy it! HaHa! That’s true, it can be a bit of a crumbly mess when chopping. I try to use an oversized cutting board so it’s not all over my counter too. But even then the little bits still roll around. LOL! You have turned a delicious dish into an amazing dish! I love that you used cauliflower in there! Thank you so much, Kristina! Cauliflower is the best! 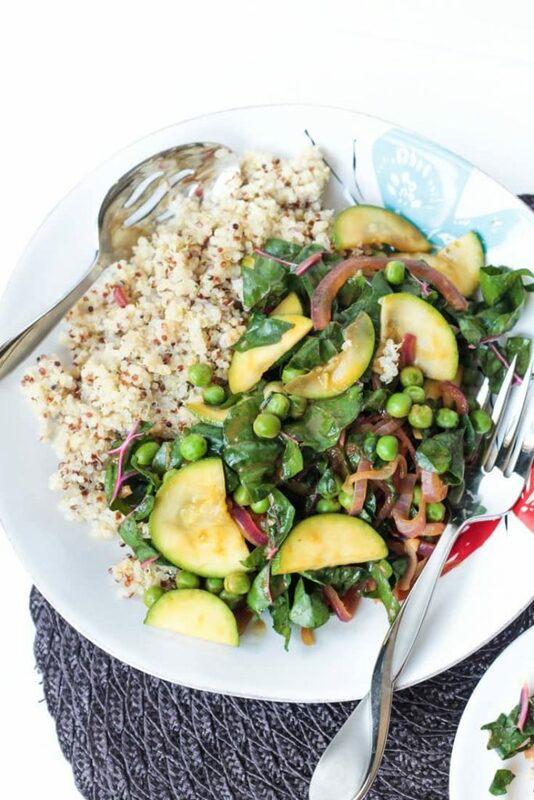 Love that you used cauliflower in this! Looks so delicious! My kind of easy weeknight meal! 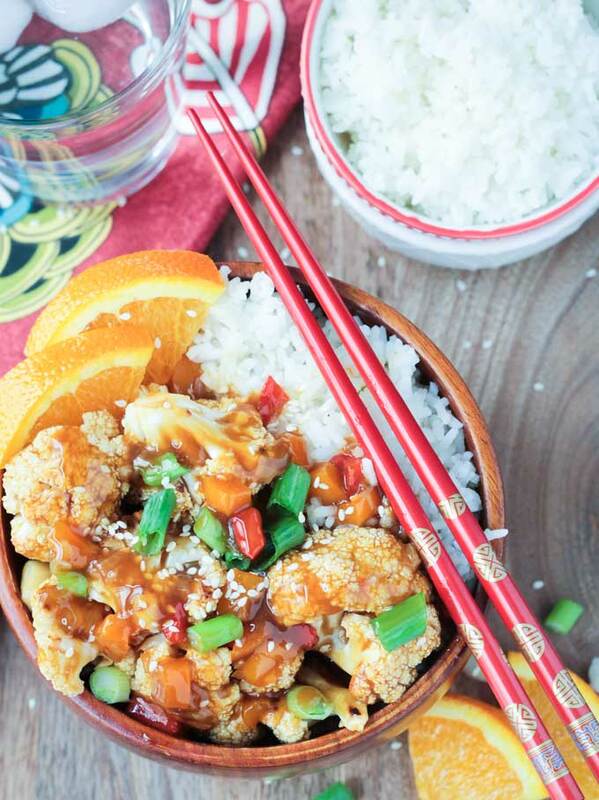 Such a great idea to add cauliflower! What a perfect dinner idea! I adore roasted cauliflower. And who doesn’t love pasta?! Put them together and you have one amazing dish! Jenn—this looks amazing! I love cauliflower too, and I can’t wait to try this! I am all about the pasta!!! And I love that it’s nut free!!! Woo hoo! Thank you so much, Sarah! My hubby loved it too and ate all of the leftovers! And he’s not always the most excited about my plant based dishes. LOL! I really hope you love it! Ha ha – can just imagine the cauliflower almost didn’t make it into the pasta. Sounds totally delicious. It was quite addictive! Thanks, Trinity! Cauliflower is one of my favorite veggies! What a great way to add it to dinner. This pasta is dreamy! I can’t get enough cauliflower! Thanks, Lorie! Looks really delicious, Jenn! 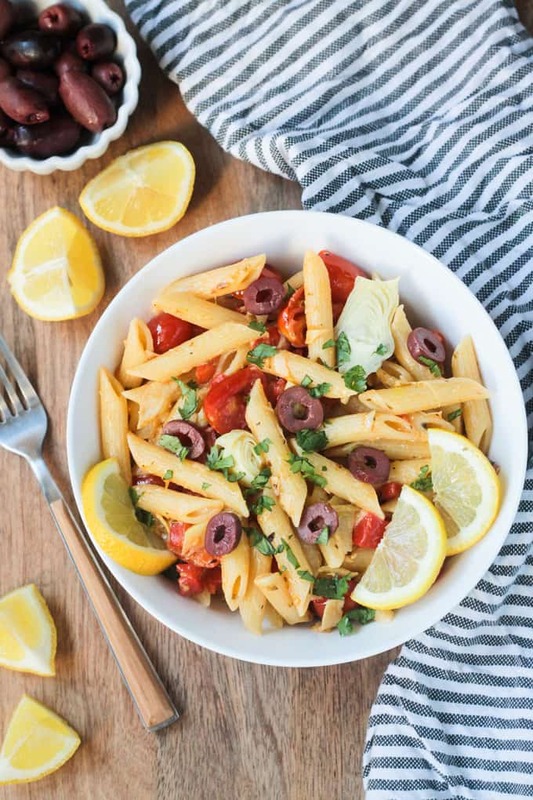 I love pasta dishes like this with lots of garlic! Thanks, Amy! It was delicious for sure!